Do you know about the world’s longest lasting light bulb? In this article you will get to know about the amazing lughtbulb that has been shining since 1901 and is recorded as the world’s longest lasting light bulb. Q. Do you know about the world’s longest lasting light bulb? Ans. The world’s longest lasting light bulb is the Centennial Light that has been illuminating a local fire house in Livermore, California for almost 114 years. It is reported to have one break in its operation when it was removed from one fire station and installed in another. 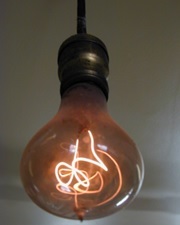 The bulb was designed by a mastermind electrician Adolphe A. Chaillet. The defining feature of the bulb was the use of carbon filament that is allowing the bulb to burn longer and at a lower temperature than tungsten-based bulbs designed by Thomas Edison. It was originally a 30 or a 60 watt bulb which has now got dimmed to emit the light as that by a 4 watt bulb. This extraordinary bulb has also found a place in The Guinness Book of World Records. Previous Article The tail of a kangaroo is almost its ‘fifth leg’. But how? Next Article Are you aware of the fact that Earth’s rotational speed is slowing down every day?